I'm not done lecturing you all about getting out in the world with a camera to hunt down some inspiration. Photographs are amazing wells of story ideas and solutions to your writing problems, but it's also about looking at everything with a storyteller's eye. I took this pic because I like taking pictures of old buildings; they're more attractive to me than modern/new/hip structures. I also liked the circular brick pattern, which may or may not have once been a window. Let's say it was, and look at it as a storytelling opportunity. 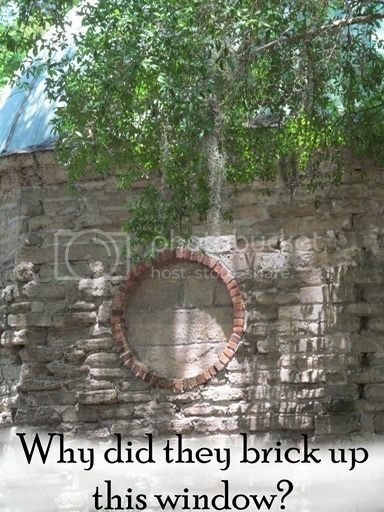 The first thing I noticed is that brick inside the circle window is much more modern than what was used to build the structure. That shows a stretch of time between the creation of this place, and a very strange renovation. So why did they brick up the window? What was inside? Were they trying to keep something in (a monster), or keep something out (sunlight)? What happens if those bricks are removed by say, the new owner, who has decided to renovate the old place? Walking around an old church, I happened to look down to see this patchwork of old porcelain tiles. I snapped a pic just because they were pretty. Now switch to your storyteller's eye. The tiles are pretty, but they're also in a definite pattern. 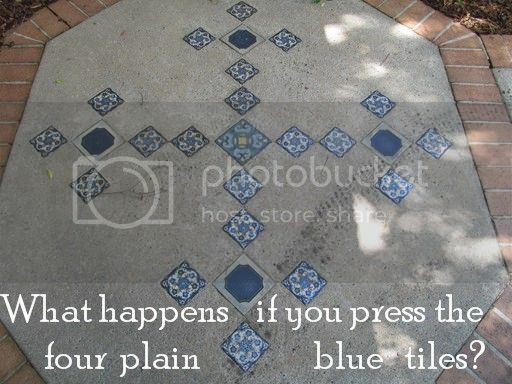 The plainer blue tiles look like buttons, too. What if they aren't just tiles? Four people walk around this church, and as they're in a huddle talking about the next sight to see they inadvertently stand on the four plain blue tiles. What happens next? How does it relate to the old church? Does it change those four people -- or are they transported to another place? 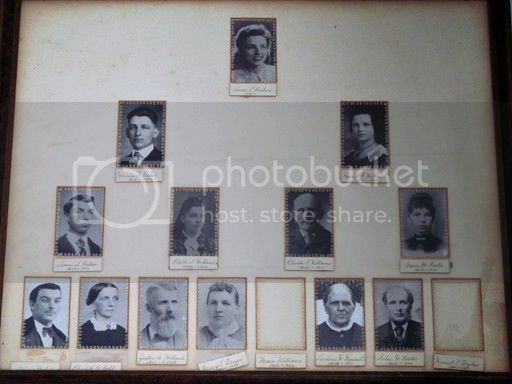 During our road trip we stopped at a little country diner to have breakfast, and I saw this quirky old family tree photo collage on the wall behind our table. I don't really know why I took a photo of it. Maybe just because it was in a diner. Two photos are missing. Perhaps the person who made the collage never managed to find pics of Moses and Harriet. But then why tag the empty spaces? What happened to those pictures? What about the two pics between the spaces? Why does Caroline look so smug (and more like a guy in drag than a lady?) What reason does Silas have to look so menacing? Or is he afraid? Imagine you're a waitress closing up the diner for the night, and you just noticed those pictures are missing -- and two people who look exactly like Caroline and Silas are sitting at a table and looking at you like you're a menu. What happens next? If I want to answer my questions about my pictures in interesting ways, I write a story. I think there is something in that old building with the bricked-in window, and the new owner renovating the place is about to set it free for the first time in two centuries. My four tourists at the church do accidentally stand on those four blue tiles, and will be transported to the time the church was being built. As for Caroline and Silas, they do corner my waitress in the diner for their own dark purposes -- at least until Moses and Harriet, her great-great-grandparents, show up. So get that camera and get out there to take some shots. Look at your pictures later with your storyteller's eye, ask questions, and use your imagination to answer them. That's all there is to it. You know, I have a really beautiful Nikon that takes gorgeous pictures almost without any help by me at all, but I never seem to find the time to take them. I'm too busy driving back and forth to work :( But I think I'm going to retire at the end of the year because I need 'me' time again. I miss that. In the meantime, I keep the battery charged for the camera and try to take pictures when I remember I have it. Really wonderful. I immediately got a few story ideas just reading your post and looking at the pics. Great idea. I probably won't do a thing with the ideas but that's another issue... sigh.